When Don Lilley was 16, he figured he didn’t need school, and quit. When he turned 17, his dad figured it was time Don learned a thing or two and took him to the local draft board. Shortly thereafter in 1964, Don was in Butte volunteering for three years as a paratrooper and was assigned to the 101st Airborne: Screaming Eagles. Don went to Fort Ord, California, for boot camp. What did he learn there? He learned how quickly his dad got smart, and kept getting smarter. After Boot Camp and his Advanced Individual Training, Don went to Jump School at Fort Benning, Georgia for four weeks. He’d only been in a plane three times when he made his first jump, and he liked it. This was not an easy school and quite a few washed out. There was a lot of physical training, and practice jumps from a 250 foot tower. He passed his qualifying jumps, graduated and got to go home for a week before his next assignment. The 1st Brigade landing at Cam Ranh Bay was made a big media event. The men were brought from their ship close to shore by amphibious landing ship tanks. The end gates were lowered and the men waded ashore. Without being allowed time to even dump the water out of their boots, they were off inland on a ten-mile hike while the cameras rolled. The U.S. was still conducting a “police action” when Don got to Vietnam. After a few months, on Aug. 7, 1964, Congress passed the Tonkin Resolution which gave the President power to declare war. Another example of a problem with the media was when Don’s unit had to re-enact a battle so a well-known TV reporter could be filmed as though he were there during the real action. In the next year Don moved around to 15 different areas ranging from Cam Ranh in southeast Vietnam, to Ben Cat on the west side near Cambodia, to Dak To in the north, a little ways below the demarcation line with North Vietnam. They were known as the “Nomads of Vietnam” because of their being sent all over the place, a real “odyssey.” Sometimes their transportation from one site to the next took them by ship out into the Bay for a day or so. Don guesses that was their Rest and Relaxation. Time went fast for Don because there was so much going on, “… not like sitting in a foxhole for days,” he says. “Operation High Land” was an assignment to secure the base at An Khe near Mang Yang Pass for the 1st Air Cavalry. At one time An Khe was a French base where the French lost to the Viet Minh in their last war in Indochina. Viet Minh were southerners who were trained by the North Vietnamese and then used as guerillas to cause chaos in South Vietnam. They became known to us as the Viet Cong, or Communist Vietnamese. “Operation High Land” illustrated the strange “rules of engagement” U.S. solders had to abide by — rules that seemed to only apply to our side. They had to obtain permission to fire at the enemy, and only after being fired upon first. “Politicians!” Don says. 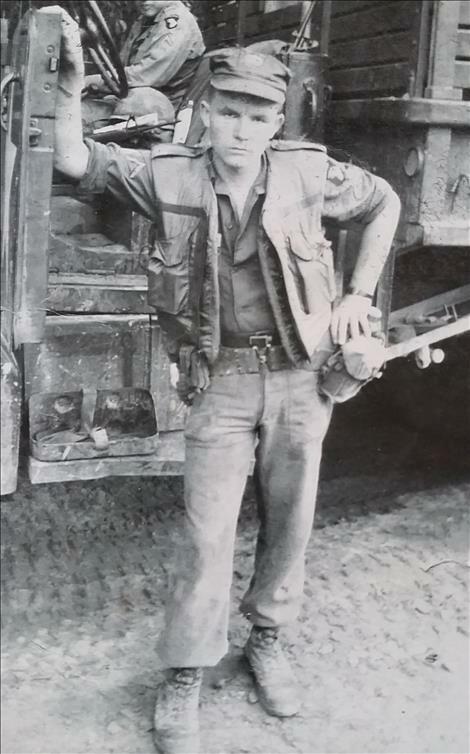 Don’s unit was one of the first to actually engage the North Vietnamese. In flying intelligence around An Khe, a flag pole was noticed in a village. When helicopters flew in to check it out, the door of one of the houses flew open and Viet Cong poured out. The U.S. soldiers did wait till the Viet Cong got their weapons and then returned fire. When Don’s one-year tour was up, he had to wait another month while his orders that somehow got lost, were found, so he really had a 13-month tour. He was flown back to Travis Air Force Base in California. He had some leave time before reporting to his next duty station, but since he was still “active,” he had to wear his uniform. Returning Vietnam veterans were warned not to let protests get to them. One minute he was in combat fighting for his country and the next minute his own people were yelling at him. It took a long time to get over it. 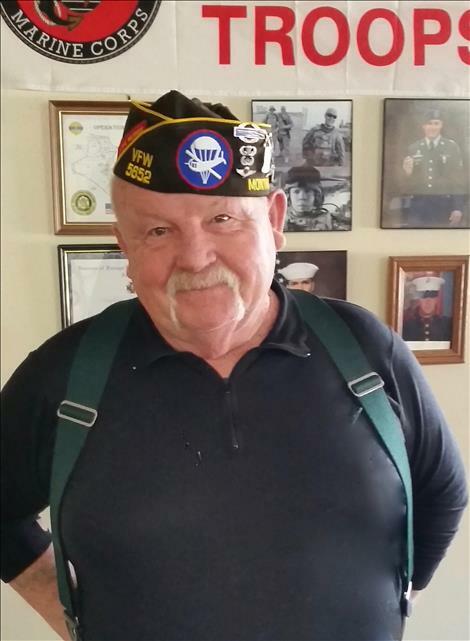 Don was assigned to the 82nd Airborne at Fort Bragg, North Carolina. Don says this is a fine unit, known today as America’s Guard of Honor; however, when he was there a 2nd Lieutenant treated him and other Vietnam veterans like recruits, saying, “We’ll teach you how to fight a real war.” Don didn’t appreciate being talked down to by someone with no experience. In order to work at Plum Creek, Don was discharged from Fort Bragg three months early on March 4, 1967. He joined the Kalispell National Guard 19th Special Forces unit. Don says, “I think the Guard saved me from some of the war demons.” He could have extended and sometimes feels like he deserted his buddies because he didn’t. He says it’s hard to do state-side duty after a war. When Don joined he had no idea where he might go, but it was an opportunity. He’d recommend any branch of the military service as a good place to start for young guys and gals, especially when there aren’t jobs available. Schools don’t do enough vocational training and the military provides hands on skills and good work skills. Thank you for your service, Don.